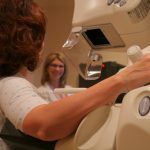 Doses of scatter radiation received from mammograms are low and do not result in an increased risk of cancer, according to research being presented by Alison Chetlen. 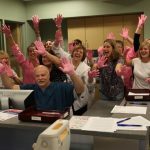 Penn State Milton S. Hershey Medical Center has won second place in the national Pink Glove Dance video competition. 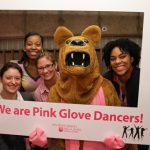 Voting is now open for the national Pink Glove Dance Video contest, and Penn State Hershey is in the running to win a $10,000 donation to the Pennsylvania Breast Cancer Coalition. Leah Cream, M.D., a medical oncologist at Penn State Hershey Cancer Institute, talks about her experiences as a thyroid cancer patient and how she feels they have made her a better physician. 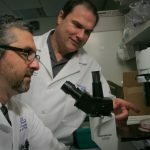 David Goldenberg, M.D., discusses the various types of thyroid cancer, how they’re detected, how they’re treated — and how the prognosis can vary depending on the type. 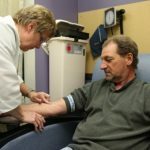 Penn State Hershey Medical Center, Lancaster Regional and Heart of Lancaster Regional Medical Centers have entered into an agreement that will offer Lancaster County residents expanded oncology services and expertise and increased access to the latest cancer research, keeping them close to home. 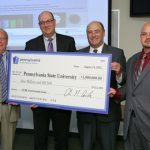 Technology developed at Penn State College of Medicine and Penn State Hershey Cancer Institute led to the recent launch of a new start-up company focused on discovering, developing, and commercializing innovative new therapies for late stage melanoma and other skin cancers.